Semiya upma recipe Kerala style is a very delicious and easy semiya upma recipe for a really quick breakfast or snack or even dinner that you can easily prepare in no time. See here delicious masala upma recipe for breakfast. You can see all Kerala recipes in my blog here. This semiya/vermicelli upma using roasted fine vermicelli noodles is also made using fresh coconut in Kerala style, and it is made without vegetables as I made this as an easy and quick semiya upma for breakfast. The semiya upma Kerala style recipe is very flexible and you can easily add sauteed vegetables to this dish if you wish, to make it more healthy. 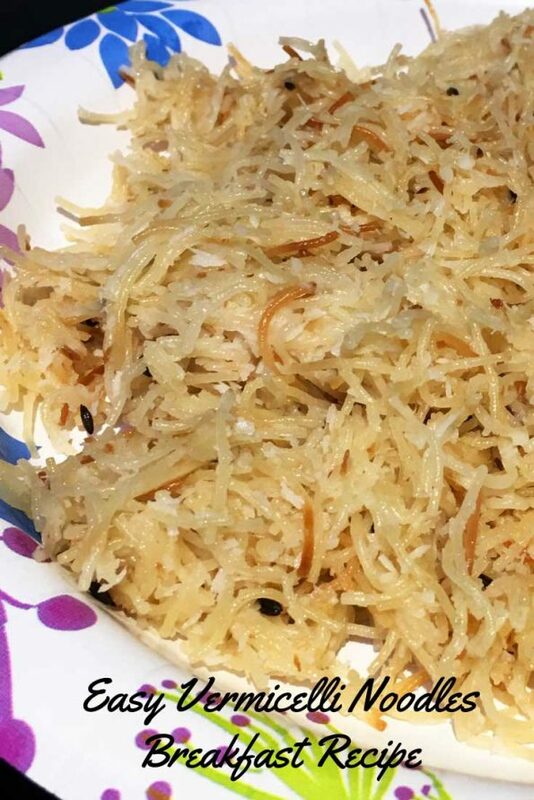 As I mentioned above, this easy and simple semiya upma recipe Kerala style is made using fine vermicelli noodles (semiya noodles which is made using durum wheat flour) and freshly grated coconut and few spices. If you don’t have freshly grated coconut you can use dry unsweetened shredded coconut. This semiya upma recipe is a quick and easy vegetarian breakfast recipe which is also healthy and it is a healthy vegan breakfast recipe as well. I have used thin fine vermicelli noddles which will be cooked easily, if you are using thick vermicelli noodles, you may need to increase the water needed to cook it (probably double the water needed for fine vermicelli noodles) and may have to cook for a longer time. 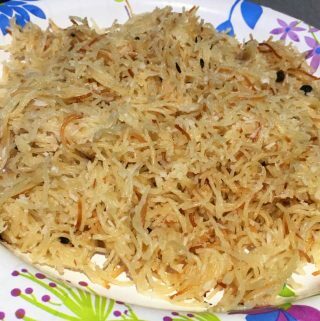 So here is how I made this delicious and simple semiya upma (vermicelli upma) following this semiya upma recipe Kerala style. 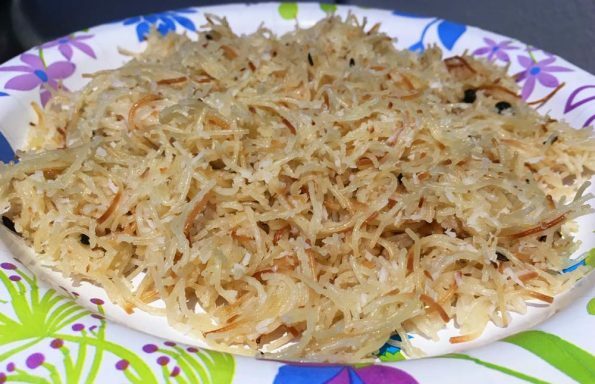 Semiya upma or vermicelli upma with coconut is very simple and easy to make for breakfast and its delicious too if you like the flavor of coconuts. Dry roast the vermicelli noodles (semiya noodles) in a pan for a few minutes. If you are buying roasted vermicelli noodles, you can skip this step. Heat oil in another pan and add mustard seeds. When the mustard seeds splutter, fry red chilies and curry leaves. Add black pepper corns and cashew nuts, fry for a few seconds. Add the dry roasted vermicelli noddles to pan and mix well, saute for 1 to 2 minutes. Add the coconut and mix well, saute for 2 minutes. Add the salt, garlic and ginger mix well and saute for another 1 minute. Switch off the stove and keep the vermicelli mixture aside. Heat the water in another saucepan, and bring the water to a boil. As the water starts boiling, add the water to the vermicelli mixture, mix everything well. Transfer back vermicelli mixture with water back to the stove, keep in low heat, cover the pan and cook the vermicelli mixture until the vermicelli is cooked and water is all absorbed. This usually takes around 3 to 4 minutes of time, but make sure you keep watching it. After 4 minutes of cooking or when the water is all absorbed and vermicelli is cooked, open the pan and mix well all the contents. You can heat it for another 1 or 2 minutes, keeping the pan open and stirring occasionally. Now the semiya upma or vermicelli upma with coconut is ready to serve! Serve the semiya/vermicelli upma hot with any chutneys you love, or you can just enjoy it as it is! 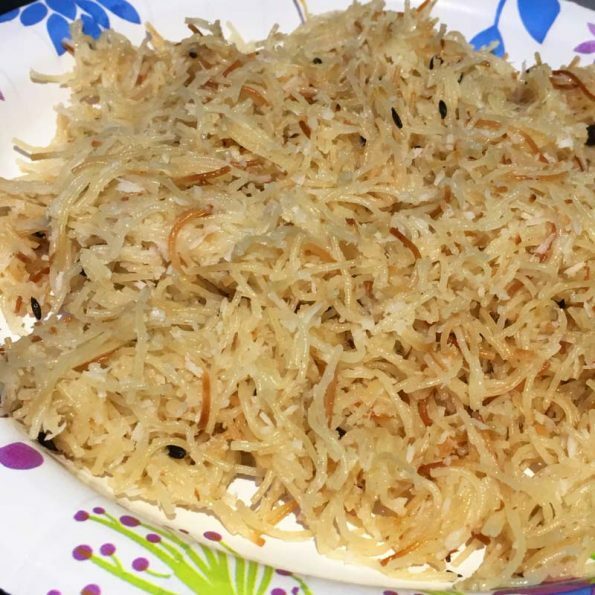 Hope you found this post easy simple semiya upma recipe Kerala style helpful!